Sometimes the biggest question when seeing a new work is “how the hell did it get to this point?” Never has that been more true than with Single Room Occupancy. 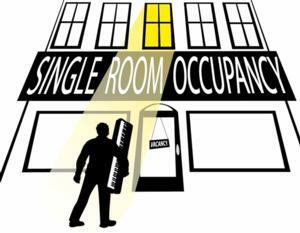 Written by Ben Rauch, brother of "The Big Bang Theory" and FringeNYC alum Melisa Rauch, with lyrics by Rauch, Gaby Gold, and Rory Scholl, Single Room Occupancy is a musical mildly-funny comedy about singer/songwriter Matt and his dating woes. Despite the title of the piece, only a scene or two actually happens in this tiny Secaucus apartment. As the show develops, we meet an assortment of random players in Matt's life including his improv pals, his self-indulgent wannabe "Bachelor" contestant Tinder girlfriend, and the Asian love of his life. What Single Room Occupancy is is a comedy writer's attempt to write a funny musical. This show is proof that not everyone should write musicals. The score has some great numbers with earworm worthy songs but Single Room Occupancy is clearly a case of previously written music thrown together to form a book musical with a plot as thin as a piece of paper. There are times when Rauch seems to forget to add dialogue jumping from song to song with little purpose. The structure is all over the place, even starting the show off with an ill-timed musical improv bit. No need to introduce a device that happens too much as it is. There is so much fluff and unnecessary material that needs greatly to be eliminated. As a book musical, the characters needed to be strong. Currently, they feel pigeonholed into the libretto to fit certain songs. Rauch is known for his song “I Love Asian Girls.” And the character of Kim may only be present so this song could be showcased. The story is sadly just not interesting. Rauch and Co. may be better suited using the material for a stand up comedy concert. The lyrics, for the most part, are witty and clever. They certainly bring laughs. But the book is severely lacking and needs a dramaturg to save it. What Single Room Occupancy does do is highlight the talents of the ladies in the ensemble. As queen narcissist Rachel, Cali Elizabeth Moore brings the funny. And a killer vocal. Her delusional manner is hilarious. So hilarious because we all know that girl. As the random girl who gets no introduction besides just showing up in the improv group, Kat Liz Kramer also shows off her pipes and cartwheel skills. And then there are the creators. Rauch, and Scholl, place themselves into the show, a decision that, for a musical, was not a smart choice. In the constraints of musical theater, Rauch is almost unbearable to listen to for nearly 20 songs. His voice is very specific and doesn't fit this genre properly. Rauch is better suited as a character actor. He's not a typical leading man. Scholl, on the other hand, knew his place as the sidekick but his character was simply unsavory. Some of those lines were just, bad. With the material written in the style it was, director Joey Murray had to play into the sitcom style. And it just didn't land. You could tell there were moments that would only garner those laugh track chuckles. But alas, there was a live crowd present who hardly knew what was funny. In a festival setting, it’s hard to stage a musical in a venue that isn’t suited for a band. So you have to adapt. And that means the band, unless they are part of the show, needs to blend into the scenery. It’s great to have musical director and keyboard player who’s so lively and into the music, but Noriko Sunamoto pulled focus, which was very easy to do when the material wasn't doing it. Single Room Occupancy needs some severe work before it can move forward. And perhaps trying out a completely different actor in the lead role. There’s no denying Rauch can write music. But carrying the weight of a musical? Not so much.